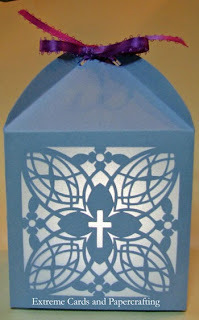 This fancy paper lantern with a cross on each panel is my version of a bomboniere favor box someone posted on a Silhouette Facebook group I belong to. It would make a pretty table decoration for a christening, Communion, or Easter celebration. You could also use it for a candy box or treat box, with or without lining the panels. The bottom folds closed and stays closed without adhesive. The top is closed with a ribbon threaded through slots. Mine is much larger (just under 4" on a side) than the sample I saw for sale, which was laser cut. I don't know whether the Silhouette Cameo could cut the design that tiny, but I do know I did not want to try to weed it! If you cut it successfully at a smaller size I'd love to know. I lined mine with vellum (template not included in the file set, you'll have to wing it) and lit it with a battery operated tea light. Download file set: Silhouette Studio, PDF, SVG (how to use my SVG files in Cricut Design Space). Files download for free; pay what you wish for the tutorial and to support this site. Suggested contribution for this project is $1.99. Cut on black lines, score on red lines. -- Resize to 8" wide. Assembly is pretty much self-evident. This is the order of assembly I used. If you're planning to use vellum backing squares, adhere them now. Adhere the lantern pieces together, using the long vertical tabs. Close the bottom as shown on the daisy tea light lantern post. Thread a piece of ribbon through the slots at the top and tie a bow. Hint: When you turn your tea light on and off it is easier to open the bottom than to untie the top!